The 1975 VW Trike For Sale is highway-worthy and ready to ride but has to be paid for and picked up in person. The motorcycle must be delivered in its current location which is in the Las Vegas, NV Nevada area. This is a trike that I truly do not want to part with but now is the time and it needs to go. The paint color and unique features all come together to present a bike with a very appealing look and ride. 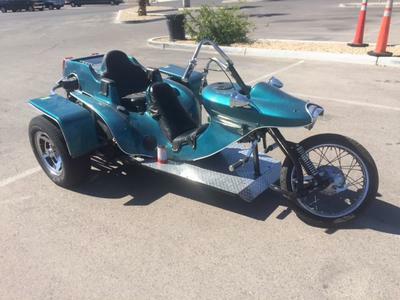 The 1975 VW Trike For Sale is in Las Vegas, NV Nevada and ready for pick up! Serious buyers can contact me for directions and details using the comment form below provided by GoGoCycles Used Motorcycles for Sale. How much would it cost to ship to me? I live in Alabama. What is the price on your trike? I am Very interested in your trike. Ready to purchase, if you still have it? What is the price on your 75 Trike? Does it have current license on it? Does it have all safety equipment: lights, tail-lights, brake lights, signal lights,horn, What brakes does it have on it? Any problems you know of on it? Thanks, for all this information.